I just completed producing the audio files for this book. It’s available now on Audible. Click on the image to go to the Audible website where you can listen to a free five minute sample. For every audiobook people listen to, someone has to create the audio recording, right? Amazon bought Audible, an audiobook company, and has automated much of this via the Amazon Creative Exchange, or ACX. 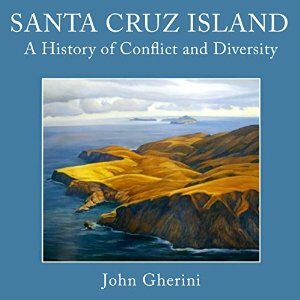 I signed up for ACX and auditioned to “produce” (meaning create the audio files) a book called Santa Cruz Island, a History of Conflict and Diversity. It took an unbelievable amount of work, including a bunch of stuff that had to be thrown out and re-read. That’s okay, since this was my first project. I’ve even created a lessons-learned list. I discovered things about my voice that I didn’t know, such as that it changes pitch slightly but noticeably during the day. Anyway, you can see the Audible page for the book by clicking here. There’s a five minute free sample of the book. This entry was posted in Audio Books, Shameless self-promotion and tagged audible, audio book, audio book production, santa cruz. Bookmark the permalink.